The Gervais softball program may have moved down to the 2A/1A Classification following the OSAA's 2018 reclassification, but it would be hard to tell based on its non-conference schedule. After the first two weeks of the season, the Cougars have been preparing for their upcoming April league games in the Special District 2 by playing primarily against 3A competition. Though Gervais (1-4) has had trouble winning against the stiffer competition, the team has thus far competed well against a slate of opponents that largely consist of playoff programs from last year. 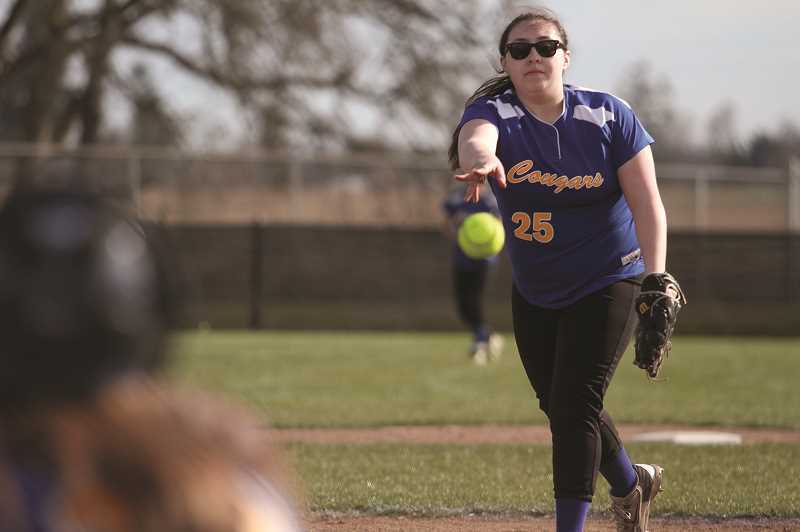 Last week, the Cougars fell twice in a pair of home games, bringing their current slide to three games following the team's 8-7 home-opening win over Willamina on March 13. 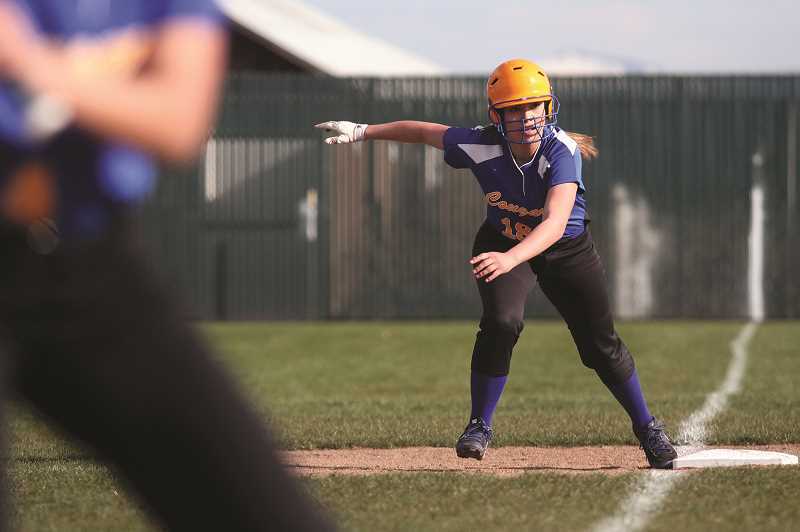 In the aftermath, Gervais dropped a 12-6 game to Scio, a 3A semifinalist last year, then nearly rallied from a 12-0 deficit to the Gaston Greyhounds on Monday, March 18, falling 12-9 after scoring all of their runs in the bottom of the seventh inning. The Cougars closed out the week in similar fashion, rallying from a 13-5 deficit to the Amity Warriors on Wednesday, March 20 to score five runs in the final inning to fall 13-10. Against Amity (1-2), a 3A quarterfinalist in 2018, Gervais scored the first blow, plating a couple runs in the first inning on a two-out single from Jamie Roberts to drive in teammates Regina Vargas and Lex Luna. But the Warriors tagged Gervais starter Veronica Esquivel for six runs in the third and fourth innings to take the lead for good. Esquivel helped return the favor in the bottom of the frame, bunting into a fielder's choice that scored junior Natali Barrera. Senior Abby Saalfeld followed with a pop fly to left field that scored Bella Vasquez, while Luna completed the rally with a ground ball up the middle that brought home Esquivel, making it a 6-5 game. But that's as close as it would get for the Cougars, who gave up seven more runs over the course of the final three innings to fall behind 13-5 heading into the bottom of the seventh. Needing a miracle to pull out the victory, Gervais started a two-out rally on a single hit by Barrera. Sophomore Alexa Rutledge followed with a double, and Vasquez singled up the left side to score Barrera. Esquivel doubled to score Rutledge and Vasquez, and Saalfeld did the same, bringing home Esquivel. A single from Luna scored Saalfeld, and Vargas added another base hit to put runners on second and third for Jasmine Fernandez, who popped out to first base to end the rally three runs short. Esquivel finished the game going 2-for-4 with two runs scored and two RBIs to go along with nine strikeouts on the mound. Saalfeld, Luna and Roberts each drove in two runs, while Luna led the team at the plate, going 4-for-5. The opening game of the week against Gaston (3-2, 2-0 SD1) was the first for Gervais against a 2A opponent. Unfortunately, the Cougars were done in by eight fielding errors, which accounting for 11 of the 12 runs scored by the Greyhounds. The game appeared to be a rout in the seventh inning when Gaston scored five runs to put their lead at 12-0 going into the bottom half of the inning. But the Cougars put their rally caps on and ran off six consecutive runs with one out on the board to cut Gaston's lead in half. Gervais tagged three more runs on Gaston starter Morgan Johnson before the Greyhounds were finally able to stop the bleeding with a game-ending strikeout against Vasquez. Luna, Vargas and Barrera each led the team with two RBIs, while nearly the entire team contributed to the final score, with all nine runs being scored by different players. Gervais will host a double-header on Wednesday against another 3A team — Blanchet (3-2) — before welcoming the Regis Rams (1-4) on April 2 in the league opener.